It's come out to about a dollar a year. The inside of those paper band folders. If you played a band instrument in school, you've seen them, from your earliest days in elementary band to your latest days in high school and beyond. "Frederick Fennell's Points for Performance." Some 50 years after he was given $50 to write the tips, they're STILL being produced and distributed by music dealers to their client school band programs. "2. Line up your chair and stand so you may look directly over the top of the music at the conductor." "7. Resonance is the whole reason for your instrument to exist and why you play it in the first place." "11. Pulse is music's lifeblood as well as yours: Lean to feel it -- for it is always present. Seek to play by it." "18. You can only read a piece of music for the first time -- once. Make that one memorable." "24. Music is not an art for the chicken-hearted: Seek what is right, but DON'T BE AFRAID TO BE WRONG." "30. Good performances are planned that way." In that half-century, millions of musicians have been exposed to these 31 axioms. Perhaps the most influential and long-lasting hints ever set to pressed paper and placed before students of any discipline -- about a dollar a year. In retrospect, if he had known the long-term impact of a project that took him one night behind a typewriter, he would probably have done it for free. He was irreplaceable -- the singular, matchless, unique in all of music, Energizer Bunny of a world-wide conductor, innovative recording artist of several dozen groundbreaking albums, festival clinician of seven decades, arranger of hundreds of band works, author of countless magazine articles, friend of thousands and fervent believer in the role and purpose of drum corps. The Maestro is gone. THE Maestro has left us. Having still traveled around the world just last year, just prior to turning 90 years old, it seemed that Dr. Frederick Fennell would live forever. Nobody ever told me he would die. Icons aren't supposed to die. He was a messiah to the wind band world, a genius in the purest sense, a gentleman in the same sense -- Frederick Fennell was all these things and much, much more. And he was a friend of drum corps and DCI. He believed in the message, in the activity's purpose and ability to stir the soul, to teach musicianship, to imbue a competitive spirit that would serve its members well through their entire lives. He literally invented an entirely new genre, the wind ensemble, with all its glittering musical transparencies, inspired by a trumpet player's comment that if he didn't play his part in one of the typical monolithically scored band transcriptions of the day, there were numerous others who would. No band director since the early 1950s has been immune from his influence and his direction. He taught at the Eastman School of Music for 30 years, but it was an inspiration in a hospital bed some 11 years before he left Rochester, New York, that changed the face of wind music forever. Timeless recordings His timeless recordings for Mercury Records, of music written especially for wind bands as opposed to transcription after transcription of previously existing orchestral works, found their way into the libraries of band directors and other music lovers worldwide. The President of Eastman, noted composer Howard Hanson, doubted the pressings would sell more than 50 copies, offering, "Well, I guess we could always give them to the alumni." He didn't need to do so. The Mercury/Eastman/Fennell recordings took the music world by storm. He personally commissioned many of the selections on each of the recordings, works we've grown up with that have defined the best of the wind band experience. And those LPs, now rereleased on CDs 40 to 50 years later, are again finding their way into the sound libraries of those who appreciate impeccable musical performances and daring musical selections that seem to have only gotten better with age. This is so appropriate, as Dr. Fennell was one of the very first musicians of any idiom to record to the newfangled idiom of the compact disc, having already been the very first to record direct-to-disk for the infant company then known to no one, Telarc. After retiring from a long stint of conductor-in-residence at the University of Miami School of Music, while in his late 70s, he relocated to Japan for the much of the next 15 years to build up a little known group named the Tokyo Kosei Wind Symphony, pouring out dozens of flawless CDs that were eagerly snapped up by music aficionados around the world, and making Kosei a household name in the band world. He did this while encouraging other top band directors to do the same, to further expose the public to the wonders of the contemporary wind band. At an age when most would be content to retire to rest and tranquility, he pumped himself up to spread his musical message to more and more people while he still could. It was as if he was on a mission from God, and perhaps he was. Into his late 80s, he was still traveling the world, spreading the gospel of his musical mission, inspiring and turning on new generations of band students in clinic rehearsals and performances, making young performers feel vital through the relentless youth of his overpowering personality. It is guaranteed that his life force will live on well beyond the limitations of his frail body, the heart of which turned on him at the age of 90. Not nearly enough time 90 years old is not nearly enough time for someone who had so much to share with the world. Please forgive me in advance the extravagance of recounting some observations based on personal encounters. I got to know Dr. Fennell through his wife, whom had published a number of my percussion solos and ensembles and for whom I had done some editing work. Elizabeth Ludwig of Ludwig Music Publishing had become a friend years before she married Frederick Fennell. And through her, I was fortunate to be exposed firsthand to one of the greatest giants of music this nation has ever produced. He was not at all overwhelmed by the station in life that he earned through hard work and a singular dedication to creating great music. One of the blessed things to happen in my life would be my almost annual visit to the Fennell's condo on the Florida gulf coast, usually after a DCI seminar, DCI World Championships or DCI regional event in Orlando. I never wanted to take the standing invitation for granted, but it was always a pleasure and a relief to hear him state (more so than ask), "You ARE planning on staying tonight, aren't you?" And of course, there were no competing plans. Until the point that I was practically falling asleep, this amazing octogenarian-plus would graciously chat about anything and everything that had to do with music. Music WAS his life, and he wanted anyone who would listen to hear why his or her own love of music was so valuable and special. I'll admit at times I had to remind myself, "This is Frederick Fennell and I'm just some guy who is far luckier than he deserves to be." My first visit to the condo was on a day in 1994 when his vast collection of music scores and books were being moved back in after being in storage for a few weeks. While they were gone for several days, their downstairs toilet had flooded the entire bottom level and the carpeting throughout had to be ripped out. This required moving out all his precious musical effects. I was already in Florida for two weeks to take care of an estate of a relative and was invited over for an escape -- as long as I didn't mind the mess I would find. When I walked into the lower level, Dr. Fennell was standing on a stepladder placing books and music on the upper levels of the bookcases. He was -- as anyone whom has ever met him knows -- quite short. After asking if I could see what he had in his hands, I casually reached up and put it in the bookcase with no effort. And thus I had a "job" for three days. And what a job it was -- being able to pepper the Maestro with questions I had long wondered about as he gleefully regaled me with his knowledge and insights. It didn't take much to wind him up. It was like listening to a perpetual winner answer questions on some sort of musical "Jeopardy." The man's knowledge of music knew no limitations, the result of reading about music and studying scores for hours every day of his life. Worried about a performance I didn't realize how single-tracked his mind was about music until the final day of the move-in. He wanted to play a CD of a new recording he had only heard in the studio while it was being produced. And thus he, his wife and I gathered on the brand new tile floor downstairs to listen to the recording, still in shrink-wrap. During the playing of the music, he had momentarily forgotten that he was no longer on carpet. His desk task chair slid away from him and he fell on the floor, the frame of his glasses piercing his right temple. It was a horrible site with profusely spurting blood over much of the floor, and honestly, I thought I was witnessing the death of the Maestro. What a relief when he came to and I could see the blood was due to injury to his head and would be something that could be fixed. In the meantime, his wife calmly got wet towels to be compressed on his head until she could call 9-1-1. All he could say was, "This is terrible. I've got to conduct the US Army Band in Washington next week." After an ambulance ride to the hospital, he was quickly taken into the emergency room and the attending doctor started to stitch him up. The doctor made small talk to take Dr. Fennell's mind off his situation and the Maestro asked the doctor who his favorite composer was. When the doctor said it was Beethoven, I swear the ashen face of the injured lit up like a Christmas tree, and he launched into a minutes-long dissertation on why Beethoven could be EVERYONE'S favorite composer. The doctor smiled and completed the stitching. I was in awe. Even in his darkest moments, music brought the man to life and nothing else mattered. A tireless promoter of marching ensembles He had no patience for anyone who spoke ill of marching ensembles and competition. He himself directed the University of Rochester marching band for several years prior to achieving his lasting fame by founding the Eastman Wind Ensemble at the University, the world's first contemporary wind ensemble. Yesterday, I received an e-mail from Randall Lamb, director of bands at Newark (Ohio) High School. Randall's son marched in the Madison Scouts this year and performed Percy Grainger's "Lincolnshire Posy" under Dr. Fennell's baton just over a month ago at Miami University in Ohio. Randall had conversations with the Maestro at music events where "he spoke of his admiration for the activity. He spoke of the dedication of the members and of their 'commitment to excellence.' Not that DCI needed it, but in many ways Dr. Fennell's 'seal of approval' gives any music idiom a greater degree of credibility." Randall continued, "I think you, and many others involved in the activity, have often faced those in the band and orchestra world that hold the marching idiom, band and corps, with little respect. I for one always pointed out, with great pride, that the greatest icon of the band world, Fred Fennell, not only realized the musical value of the marching band and drum corps, but was indeed A FAN. I fondly remember one occasion, concluding a conversation with an 'antimarching, snobbish music professor' with the comment, 'Oh, by the way -- before talking down the marching activity again, you might want to discuss its value with the man whose picture you have hanging in your office.' That picture was, of course, of Dr. Fennell." Fennell at DCI World Championships In 2001, DCI's Ed Dempsey was turned on by the idea of bringing in Dr. Fennell for the DCI World Championships in Buffalo. As a result, thousands of buglers in the massed opening ceremony can now claim to have performed under the baton of the Maestro. The photo of Dr. Fennell, arms out in joy, with a smile on his face as wide as the field, became an instant classic. Ed arranged for a large blow-up to be sent to the Fennell residence, where is now on display in the living room, framed and in a position of prominence that can't be missed. Dr. Fennell would point to the photo and proclaim it to be the best photo of him ever taken because it so clearly demonstrated his joy of working with young musicians. 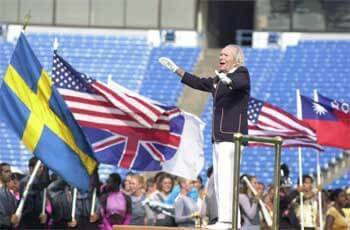 Fennell conducts the combined DCI corps in 2001 -- one of his favorite pictures. The night before the opening ceremony, Ed arranged for me to take Dr. Fennell to a rehearsal of Santa Clara Vanguard. This was the year of their "New Age Metropolis" show. The entire staff and management were quite honored to have him in their presence. He said he wanted to see the rehearsal, and so we sat in the stands as the corps went through their paces. There was a section the staff was trying to work out where the pulse wasn't locking in correctly. He leaned over and whispered something like, "The bass drums are too far back." A couple minutes later, a staff member stopped the corps and ordered the bass drums to reposition themselves forward. Naturally, my jaw dropped. He absolutely loved the sound the horns got in Norman Dello Joio's "Variants on a Medieval Tune," a work he had personally recorded more than once. He commented that the corps' soaring tonalities were at least equal to anything he had ever heard in a concert hall, even regarding the field as a concert hall. Refer to these interviews, for further insights into the Maestro's convictions: Frederick Fennell talks with DCI judges Frederick Fennell talks about drum corps. At the end of the rehearsal, he asked to speak to the members. He told them how impressed he was and how wonderful it was that they were involved in drum corps, and how the experience would pay them back throughout their lives. For ten or so minutes, it was hard to see anyone actually breathe, as they held on to every word he said. And here Dr. Fennell was at his best, inspiring and motivating students to achieve greatness, just as he did in the regular indoor concert halls. At the DCI World Division II & III Finals, during the performance of the Patriots (from the same town as his Eastman School of Music), he turned and said, "I wish we had something like this in town when I was there." No doubt he would have insisted that many of his illustrious musicians go participate in the corps to learn something more about life. At the Division I quarterfinals contest that year, instructors brought members in uniform up to his seat in the stands all day long, members who were thinking of becoming band directors, members who had played under his baton, members who asked to meet him when they heard he was in the stands. I'm convinced many of the instructors were looking forward to meeting him themselves. Dr. Fennell never tired of talking to those who wanted to meet him, signing autographs, and offering encouragement. He said it kept him young. Everyone deserves time In his book, everyone was an equal and everyone deserved whatever time they wanted with him. They would mention something like, "I performed in an honors band under you three years ago in ..." and he then told them what was on the concert. This past year, Ludwig Music Publishing released a CD titled "You've Been Verrry Good! !," performed by the Fennell Symphonic Winds, a "pickup" group of many of his friends and former students. The Maestro is on the cover, dressed up as Santa Claus. The recording consists of several holiday tunes and was recorded under the baton of the then 89-year-old conductor. It was atypical of his much more serious projects, but it captured his belief that music didn't have to be highbrow to be good, one of the reasons he enjoyed the popular selections played by drum corps as well as the heavy-duty symphonic works. And in a sense, the title was his way of telling us that we really are good, that we are worthy, that our goodness is recognized and now we receive the present of music for our time and dedication. It fit in so well with his constant yearning to give of himself to others. In an e-mail sent out Tuesday, Dec. 7, by his daughter, Cathy Fennell Martensen, and widely distributed by a huge network of fellow musicians, Cathy announced the death of her father. This e-mail followed shortly one that was sent out announcing Dr. Fennell's "severe and irreversible" heart damage. In an irony for the ages, the musician with enough heart to share with the world would face his final moments with a heart that was too tired to beat another beat of music. I want you, and the greater music community, to know that my father died peacefully in his sleep early this morning, Tuesday, December 7, 2004. With the help of Hospice, he arrived home in time to see the brilliant orange and pinks in the western skies last evening. A bit before midnight, Dad told me he was "frustrated and disappointed." When I asked him, "Why?" he replied, "There's no drummer here yet. I can't die without a drummer!" I told him that I loved him, and that "Heaven's best drummer was on the way." Moments later he said, "I hear him! I hear him! I'm OK now." This was my final conversation with my dad. Frederick Fennell started his musical career to the beat of the drum and he ended it the same way. I'm sure that if they had known, if there had been time, countless drummers in the State of Florida would have shown up at his doorstop to play his favorite cadence, "The Downfall of Paris." Dr. Fennell was born into a family of Revolutionary War music buffs and he once told me this simple piece of drumming, known to all who have lifted a pair of drumsticks, was one of the most perfect pieces of music ever written. I would like to call upon all drummers who can do so to gather in spirit at noon, Eastern Standard Time, this Saturday, Dec. 11, to get out your drumsticks and play this most ancient and beloved of drum cadences. We can call it "Cadence Across America," the act allowing drummers to pay their respects and be united in common bond. The rest of us can still be involved through our own personal tributes. If you play a trumpet or bugle, maybe a soulful chorus of "Taps" at that time would allow you to "connect" with the drummers. But most of us neither play drums or trumpets or bugles. However, those of you can do your thing as well. Dr. Fennell loved good music, any music as long as it was good. And he deeply enjoyed drum corps and was in awe of what was accomplished on the field. How about if the rest of us, the majority for sure, were to dig out the one thing we all have -- a drum corps recording? Put it on the stereo system or call it up on you MP3 device, sit back, listen, enjoy, and salute the memory of the Maestro. Any drum corps recording would do, but if you have Santa Clara's 2001 "New Era Metropolis" show, go for it. In the meantime, I really hope and pray that St. Peter arranged for a drummer. I've got to believe he got his drummer.